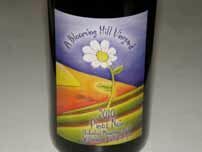 Located outside the small towns of Cornelius and Forest Grove, this vineyard is in the Chehalem Mountains AVA. Planting began in 2000 and the first Pinot Noir was released in 2008, winning a number of awards. The 2011 Pinot Noir won a Double Gold at the Oregon Wine Awards. The vineyard is 10 acres of Pinot Noir (Pommard, Wädenswil, annd 777), Pinot Gris, Chardonnay and Riesling all on 1014 rootstock. Owner Jim Witte ran a television production company involved with Sesame Street and The Electric Company and was the business manager for KISS. He is now retired and is the vineyard manager and winemaker. His spouse, Holly does sales, marketing and business management. The two wine dogs, Gemini and Trouble, appear in the Wine Dogs USA book 3rd edition. Most of the winery's small production is sold through the tasting room at 5195 SW Hergert Rd. in Cornelius which is open weekends from 12:00 to 5:00.